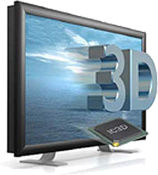 NSR research predicts there will be a global maximum of 200 channels in 3D in 10 years time. It says much of the current hype is only propelled by the determination of flat screen makers to develop a new market but it sees no genuine swelling of demand and believes 3D TV will not exceed niche status. In addition to detecting little consumer demand NSR says 3D production, particularly of live events, will remain costly and complicated and believes even big pay TV operators will limit themselves to a few channels. It estimates there will be approximately 200 full-time 3D channels will be carried globally within the coming ten years with the DTH pay as the leading platform. By comparison it says there will be 6,000 HD channels over the same period.